A milestone in anyone’s life is their wedding, that one pure day of love and emotion that lives in the memories of the couple, their families, and their closest friends. 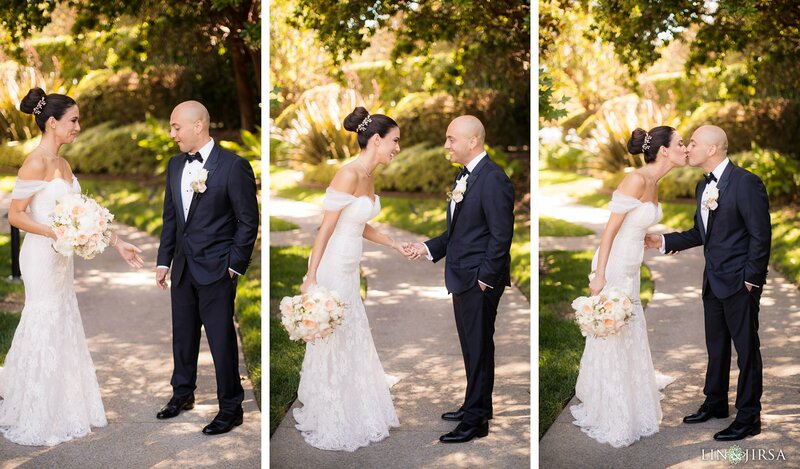 One of the most memorable events of the day is when the bride and groom see each other for the first time. For a brief moment, all of the nervousness and anticipation disappears and the couple enjoys an emotional connection that they’ll cherish forever. The first look is a modern tradition involving a one-on-one photo session between the bride and groom where they see each other for the first time prior to the ceremony. The showcase of the gorgeous wedding dress, the spiffy new tuxedo, and that gleam in your partner’s eyes are captured during this intimate occasion. After documenting hundreds of couples during their first look, we’ve selected the top 5 reasons why you should incorporate this session into your wedding day. First looks take the brilliant moment we all cherish and makes it about the stars of the day. This photo session slows everything down to a cozy moment and gives you the chance to bask in the affection you both have before the frenzy of a wedding day. Most importantly, this quiet moment will allow for you to get out the jitters and nerves so you feel and look relaxed and comfortable for the rest of the photos. Ironically, a first look is one of the very few moments where you’ll get to enjoy each other’s company. The rest of your day is filled with family and friends that can’t help but share their love and excitement with you! This is also the perfect moment to get your formal couples session finished before moving onto group photos. The best thing about getting formal photos done at the beginning of the day: you look incredible! Of course, you’ll both look amazing all day, but a first look is done before the ceremony and reception when your hair is in place, you haven’t cried off that bottom mascara, and neither of you has gotten the chance to dirty your attire. Scheduling time for photos before the ceremony with a first look and after your ceremony, ideally during sunset, allows for more beautiful photo opportunities. In addition, weddings are unpredictable and there are often delays. It would be a shame to reminisce about your wedding day and wish you had more photo time scheduled! It is not ideal to rush pictures after your ceremony for reasons like the sun already setting or a ceremony running longer than expected. In addition, a first look will save time later when the transition from ceremony to reception takes place. With all of your photos done, you can do something seemingly unheard of: actually, enjoy the cocktail hour with the rest of the guests. There’ll be plenty of moments to capture during the ceremony and the reception. Plenty of opportunities to catch lingering glances, a well-timed laugh, and a wistful tear. There’s only one first look, make sure it doesn’t slip by. Check Out Our Pinterest Board To See More!